Call 77 345 123, or write us here. A lot of modern websites are made in the CMS-system wordpress. In fact more than a quarter of all websites are made using wordpress, and more than half of all the websites that use a CMS is running wordpress. That is a convincing statistic, that emphasizes how all-round wordpress is as a website tool. Even though wordpress started out as a blogging-platform when version 1.0 was released back in 2004 it has since developed into one of the most flexible CMS’ out there, almost no matter what type of website you are talking about. Our hosting accounts are setup for maximum performance in wordpress. WordPress adjusts to your needs, and it is super easy to get started, no matter if you are using your hosting account for a blog with travel stories, a company website introducing potential customers to your business or if wordpress is going to serve as your primary business and you need to create a full webshop with thousands of products on your hosting account. 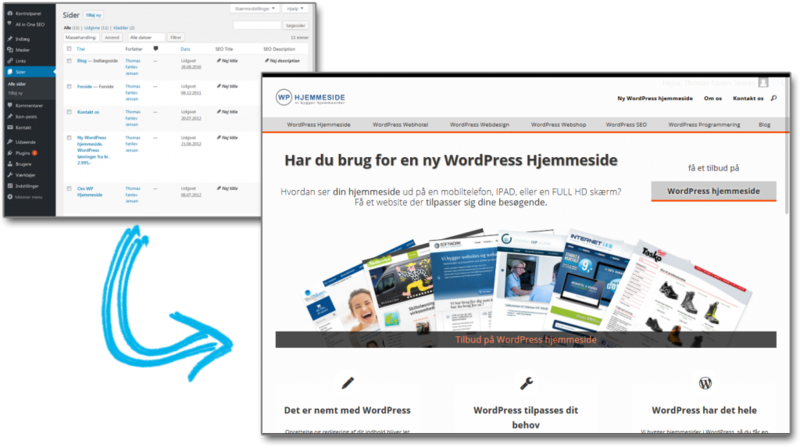 You can have wordpress installed in Danish or English, both in regards to the front- and backend. And you can always switch language if you change your mind… or install a plugin that lets your visitors switch language themselves. The possibilities are endless with wordpress. When you buy a hosting account with us, we install wordpress as a service, so your website is ready to go – no matter if you have tried it before or not. Read more about WordPress website here. You can have wordpress installed on all our hosting solutions, even our basic-solution which is cheap - actually among the cheapest on the Danish market. Or order a PRO or VIP account, if you need a really fast website. They run on lightening fast SSD disks, so you get absolute optimum performance on your wordpress hosting account. All prices are in DKK including VAT unless stated otherwise.